When these less-than-optimal-conditions happen to me, I add, “At the end of the brew day, it will be beer.” These “Brewzasters” have happened at the professional level and produced some great beers; Lagunitas’s “Brown Shugga” was created when they added brown sugar to a batch of their Olde Gnarly Wine that was failing. These beers that come about from ‘making do’ may not fall into a class under the Beer Judge Certification Program guidelines but they can taste pretty darn good. The beer that would become to be known as “steam beer” originated east of Sacramento on the American River in 1848. That is where and when John Marshall discovered gold. When the news leaked, immigrants flooded into California. 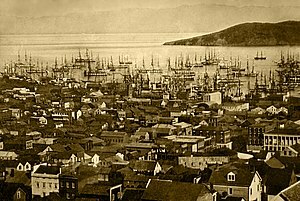 Between 1848 and 1850, California’s population increased tenfold from around 8,000 (non-native) to nearly 90,000, and the hamlet of San Francisco swelled from 1,000 to 20,000. The newcomers wanted beer. These Forty-Niners, needed something to slake their thirst. The water was not safe to drink. They wanted lager. Lager beer was the new big thing, having been introduced by German immigrants to the east coast of the United States less than ten years earlier. However, the cost of shipping beer from the east coast to California was astronomical. In those days shipping to San Francisco meant a 15,000-mile boat trip around the southern tip of South America. Or it meant an 8,000 mile journey to the Caribbean side of the Isthmus of Panama, going by canoe and then by mule through 80 miles of jungle to Panama City where steamships anchored infrequently, and reloading the cargo, and continuing on to San Francisco. Obviously, brewers had to make the beer close by to be affordable, even by the inflated prices of stuff during the Gold Rush. However, California brewers had two problems: First, lager beers were fermented at 45–55 °F (7–13 °C), and second, they needed near-freezing temperatures to store (lager) the beer. California had neither of those. On the east coast and midwest, breweries started by German immigrants located themselves near lakes that froze in the winter. That meant they had a ready supply of ice. In California, except for the Sierra Nevada in winter, there was nothing comparable. Plus, lagering took several weeks—too long and too expensive for impatient and thirsty miners. When conventional does not work, it is time to get unconventional. The brewers decided to try making lagers under warmer conditions. San Francisco has a cool climate, averaging in the high 50s during the winter to the low 70s during the summer. And for the brewers, that was close enough. They used cold-loving lager yeasts at temperatures that were more appropriate for brewing ales (60-68 °F or 16–20 °C) and a hybrid, “steam beer,” was born. Wahl and Heinus warned that brewers needed to take “precautions” to make sure that the clarifiers were not “too cold, so as to give the wort running out of the tubs a sudden setback which may check fermentation.” A brewer would not concern himself with a clarifier being too cold if the purpose was to cool the liquid, where “the cooler, the better,” would be the rule. Steam beer tasted fruitier than lager due to esters being produced by fermenting at a slightly warmer temperature, but less so than ales. The warmer temperatures also meant the yeast finished fermentation faster, which was just fine with the brewers who were looking only to make something that tasted okay to the miners. Make no mistake, the California brewers of the gold-rush era weren’t trying to be revolutionary; they were trying to meet a demand. According to Wahl & Heinus, after a few days in the clarifiers, the brewers would ensure carbonation by adding “about five gallons” of Kräusen, rapidly fermenting beer from a recent batch, “per one general trade package called one-half barrel or 15 gallons.” This added rapidly fermenting beer would occupy “about 33 to 40 per cent” of the keg. To say this method ensured the beer would be carbonated understates the result. Wahl & Heinus reported pressure ranges from “40 to 70 pounds” per square inch “in each trade package.” Besides super- carbonating the cask, this method probably kept unwanted spoilers from ruining the beer. No one knows why or how this unique beer style came to be known as steam beer. The stories do agree that many breweries sprouted in the west during the Gold Rush days (San Francisco had twenty-seven breweries in 1860) and they all made a beer called “steam beer.” It is possible that the beer, fermenting in the shallow open vats on rooftops, wafted clouds of steam in the cool morning air. Perhaps steam beer was named after Dampfbier (literally: steam beer) brewed for centuries in southeastern Bavaria near the Czech border, and called steam beer because it produced “steam” during fermentation. Perhaps it was called steam beer because it acted like steam. In 1849, to say something was steam powered meant it was fast and good. Steam meant new and exciting in those days; similar to the way “atomic” was used in the 1950s. “Steam” brimmed with revolutionary changes. Steam powered locomotives were faster than anything else around. Steam meant fast, hip, cool, new, and exciting—no boundaries existed for steam. While I like the last possibility and think it had much to do with the beer’s name being used across the west coast of the United States, Wahl and Heinus say it was due to the “high effervescent properties and the amount of pressure (‘steam’) it has in the packages.” A cask would vent “steam,” as though it was a locomotive, when tapped. The term Steam Beer dates back to the Gold Rush, the Anchor Brewing Company trademarked the term in 1981, after all, they were the only brewer left producing a product they called “Anchor Steam Beer.” Beer historian, Martin Lodahl wrote of this event, “[It] could be argued that the term [steam beer] has passed out of the general usage and into the specific, and further, that anyone else using the term for a commercial product could expect to benefit by Anchor’s prior use of the name.” That is if you made a steam beer, you were getting a boost from Anchor Brewing’s hard work, besides, Anchor had really changed the recipe over the years. After Anchor trademarked a term that had been around for 130 years to describe a distinctly west coast-style beer, a new name was needed. Contemporary brewers have selected “California Common” to describe a beer that uses lager yeast fermenting at ale temperatures. Anyone who has sampled a California Common beer would agree it is anything but common. It is unique. How about Atomic Beer? If you want to be authentic and brew to style, Wahl and Heinus say your grain bill could be, “malt alone, malts and grits, or raw cereals of any kind, and sugars, especially glucose, employed in the kettle to the extent of 33 1⁄3%,” and “roasted malt or sugar coloring” added “to give the favorite amber color of Munich beer.” Mashing temperatures should be, “as a rule…taken about 140° to 145°F. Then to 149° to 154°F., mashed 10 to 15 min., and then raised to 158°F. as final temperature….The mash is allowed to rest about 45 min., and the same precautions taken in running off wort and sparging as in other mashes, the sparging water to be about 167°F.” Target gravities ranged from 11 to 12 1⁄2 percent Plato (1.044-1.050). Add “three-fourths of a pound” of hops per barrel (about two ounces for a five gallon batch) “in the usual way.” After a one-hour to two-hour boil, the wort should be cooled quickly to 60° to 62°F. It is up to you whether to use a clarifier and leave the wort exposed overnight. As for carbonation, for safety’s sake, stick with three or four ounces of corn sugar per five gallons or one cup of malt extract. Stay away from adding 30-40 percent Kräusen to bottles—the bottles could easily explode to cause serious injury or death. If Wahl & Heinus’s recipe is too general, Horst Dornbusch provided some good ones in December 2004 Brew Your Own. I like that he recommends Cluster hops rather than Northern Brewer. Cluster hops were grown extensively in the U.S. until just after 1910. He also recommends using malt extract or wort for priming, in keeping with the German brewers who started the style. Start your mash at 130 °F (54 °C) for a 30-minute rest and increase the mash temperature, using a combination of hot-water infusion and direct heat, to 152 °F (67 °C) for a 60-minute saccharification rest, then to 168 °F (76 °C) for the mash-out. Recirculate your wort until it runs clear (about 15 minutes) and sparge with 170 °F (77 °C) water until you reach a kettle gravity of about 1.047 (11.8 °P) to account for evaporation losses during the boil. Boil for 75 minutes. Add the bittering hops after 15 minutes and the aroma hops and Irish moss after 70 minutes. After shutdown, let the brew rest for about 15 minutes. Pitch yeast at between 58 °F (14 °C) and 72 °F (22 °C). Ferment for 10 days and rack. Allow an additional week for secondary fermentation. Rack again and prime for packaging. Let the brew condition in bottles or in a keg for another two to three weeks. Coarsely mill the 2.1 lbs. of specialty grains and place them into a muslin bag. Immerse the bag in cold water and heat slowly, for about 30 minutes to 170–190 °F (77–88 °C). Discard the bag without squeezing it and mix the liquid with about 4 gallons (15 L) of brewing liquor. Heat the liquor and stir in the liquid malt extract. Bring the dissolved malt extract to a boil. Boil for 75 minutes. Add the bittering hops after 15 minutes and the aroma hops and Irish moss after 70 minutes. After shutdown, let the brew rest for about 15 minutes. Pitch yeast at between 58 °F (14 °C) and 72 °F (22 °C). Mix the malt extracts with your hot brewing liquor in the kettle. Bring the wort to a boil, and boil for 75 minutes. Add the bittering hops after 15 minutes and the aroma hops and Irish moss after 70 minutes. After shutdown, let the brew rest for about 15 minutes. Pitch yeast at between 58 °F (14 °C) and 72 °F (22 °C). Smith, G. (1995). 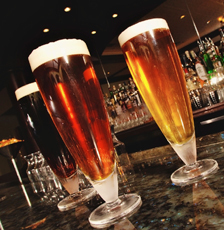 Beer: A History of Suds and Civilization From Mesopotamia to Microbreweries. New York, New York: Avon Books. The Brewers Association has released its annual lists of the top 50 craft and overall brewing companies in the U.S., based on 2011 beer sales volume. Of the top 50 overall brewing companies, 36 are small and independent¹ craft brewing companies¹,². The Brewers Association is the not-for-profit trade association dedicated to small and independent American brewers, their craft beers and the community of brewing enthusiasts. The Brewers Association (BA) represents more than 70 percent of the brewing industry, and its members make more than 99 percent of the beer brewed in the U.S. The BA organizes events including the World Beer Cup®, Great American Beer Festival®, Craft Brewers Conference and BrewExpo America®, SAVOR℠: An American Craft Beer & Food Experience and American Craft Beer Week. The BA publishes The New Brewer magazine and its Brewers Publications division is the largest publisher of contemporary and relevant brewing literature for today’s craft brewers and homebrewers. In this piece from California Pilgrimage, Michael Jackson and Fritz Maytag (and members of the Anchor Beer team) watch the harvest of the barley for Anchor’s Christmas Ale. They are at a farm near Tule Lake near the Oregon border. The Dutch sub-titles add a certain je ne sais quoi. Michael Jackson, The Beer Hunter, died of a heart attack in August of 2007 at the age of 65. He had suffered from Parkinson’s and diabetes. In this piece of California Pilgrimage, Michael Jackson and Fritz Maytag (and members of the Anchor Beer team) head for Tule Lake near the Oregon border to visit Anchor’s source of barley. Along the way, they stop at the Napa Valley Brewing and Mendocino Brewing brewpubs and Fritz talks about the differences between beer and wine.